This is how almost all websites use the space available on the sidebar, footer area or other widget areas: no matter which part of your website your visitor is looking at, they will always see the exact same content. It disregards the fact that different people come to different parts of your website for different reasons. Instead, it treats everyone with a "one-size-fits-all" approach. It forces you to show generic content in your widget areas, hoping to appeal to as many people as possible. Your widget content isn't particularly relevant to anyone and gets ignored by almost everyone. 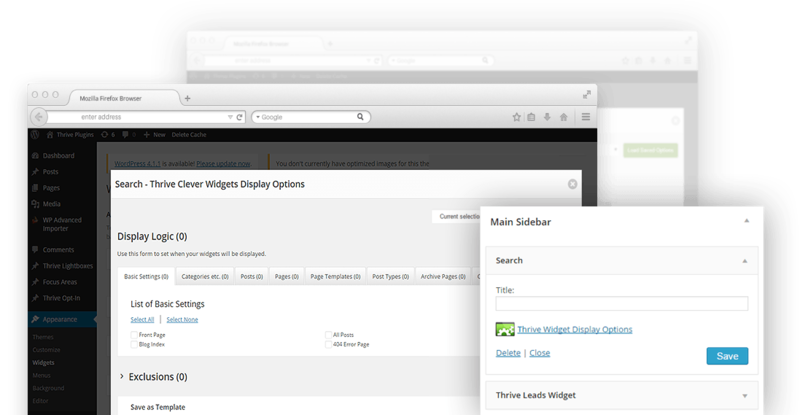 Using the Clever Widgets plugin, you can easily show highly relevant content in your widget areas. Instead of a generic offering that barely raises an eyebrow, you can show your visitors the kind of thing that makes them say "this is exactly what I've been looking for!" And for you, that means more clicks, fewer bounces and higher conversion rates. Clever Widgets acknowledges the simple fact that your website visitors are telling you a lot about themselves simply by which posts and pages they are looking at. With the Clever Widgets plugin, you can now determine precisely where your widget content should be shown to visitors, based on categories, tags, post types and even down to include and exclude rules for specific pages. 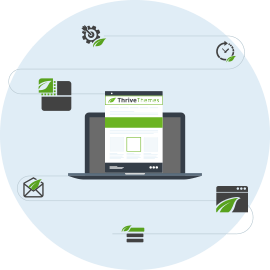 Thrive Clever Widgets is a WordPress plugin that seamlessly integrates with the default widgets options in WordPress. For any widget you add to any widget area, you'll see this new link appear, once you have the plugin installed. In an intuitive interface, you can then determine exactly where your widget should be shown. Here at Thrive Themes, we are obsessed with speed. The speed of websites, to be more exact. The reason is simple: nothing decimates the user experience and ruins conversion rates like a sluggish website. "Will it slow down my website if I create dozens of widgets with intricate targeting options?" Ready to Make Your Website Better for Your Visitors and Your Business? Use Thrive Clever Widgets on all of your personal websites AND get access to all of our themes and plugins instantly, by becoming a Thrive Member today!